While Egypt's Great Pyramid of Giza is by far the most talked-about pyramid in the world, it isn’t the biggest by a long shot. That title goes to the Great Pyramid of Cholula - an ancient Aztec temple in Puebla, Mexico with a base four times larger than Giza's, and nearly twice the volume. Why is the world's biggest pyramid so often overlooked? It could be because that gigantic structure is actually hidden beneath layers of dirt, making it look more like a natural mountain than a place of worship. In fact, it looks so much like a mountain, that famed Spanish explorer Hernán Cortés completely missed it, and unwittingly built a church right on top of it, as you can see in the image above. 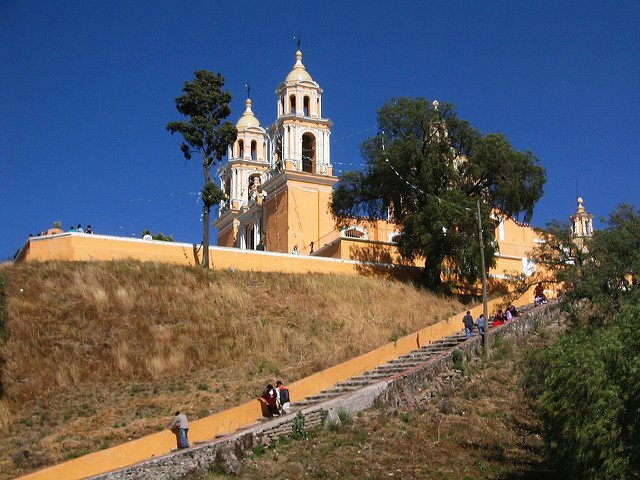 To understand how awesome the Great Pyramid of Cholula is, we must jump back to well before Cortés and his army planted a symbol of Christianity on its peak. Known as Tlachihualtepetl (meaning "man-made mountain"), the origins of the pyramid are a little sketchy, though the general consensus is that it was built in around 300 BC by many different communities to honour the ancient god Quetzalcoatl. As Zaria Gorvett reports for the BBC, the pyramid was likely constructed with adobe - a type of brick made of out of baked mud - and features six layers built on top of each over many generations. Each time a layer was completed, construction was picked back up by a new group of workers. This incremental growth is what allowed the Great Pyramid of Cholula to get so big. 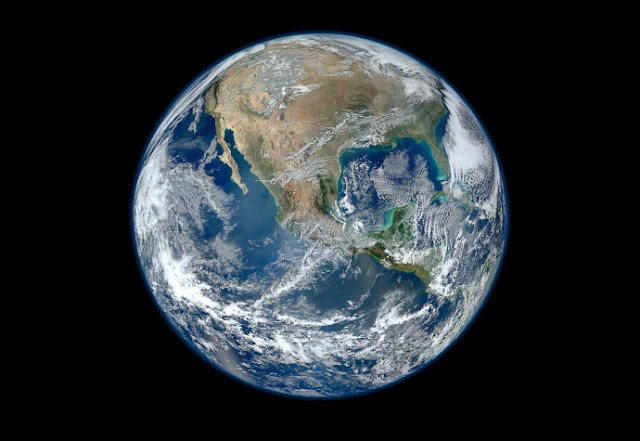 With a base of 450 by 450 metres (1,480 by 1,480 feet), it's four times the size of the Great Pyramid of Giza. Before it was replaced by newer structures, it was painstakingly decorated in red, black, and yellow insects. But without maintenance, the mud bricks were left to do what mud does in humid climates - provide nutrients to all kinds of tropical greenery. "It was abandoned sometime in the 7th or 8th Century CE," archaeologist David Carballo from Boston University told Gorvett at the BBC. "The Choluteca had a newer pyramid-temple located nearby, which the Spaniards destroyed." When Cortés and his men arrived in Cholula in October 1519, some 1,800 years after the pyramid was constructed, they massacred around 3,000 people in a single hour - 10 percent of entire city’s population - and levelled many of their religious structures. In 1594, after settling in the city and claiming it for their own, they built a church - La Iglesia de Nuestra Señora de Los Remedios (Our Lady of Remedies Church), on top of the hidden pyramid mountain. 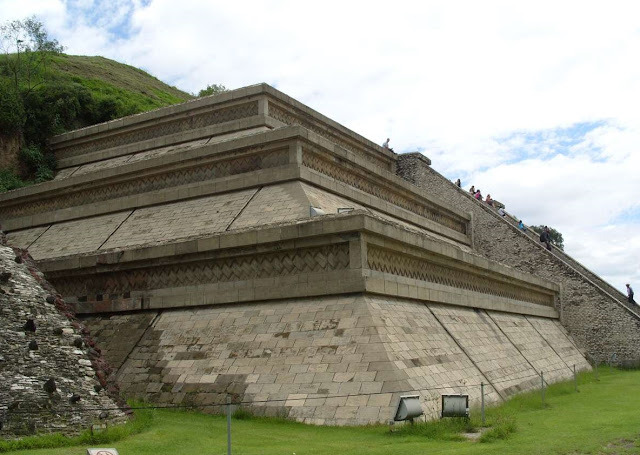 It's unclear if the Aztecs knew the mud bricks would encourage things to grow all over it and eventually bury the entire structure, but the fact that it looks more like a hill than a pyramid is probably the only reason it still survives today. And just as well, because according to the BBC, not only is it the world's largest pyramid, it retains the title of the largest monument ever constructed anywhere on Earth, by any civilisation, to this day. The pyramid wasn’t discovered until the early 1900s, when locals started to build a psychiatric ward nearby. By the 1930s, archaeologists started to uncover it, creating a series of tunnels stretching 8 kilometres (5 miles) in length to give them access.